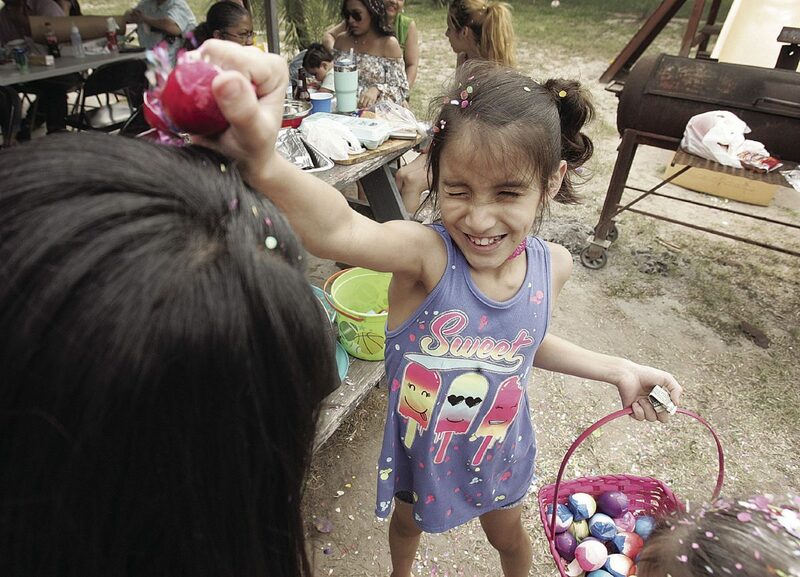 Keina Baccao, 8, cracks a confetti-filled egg shell on the heads of family members at a backyard party celebrating Easter on Sunday, April 15, 2017 in Pharr. The Rio Grande Valley will mark Easter weekend with parties and egg hunts and more Saturday and Sunday. Festiva has compiled a list of what to do and where to go to celebrate. Museum of South Texas History will host Cascarón! from 1 to 3 p.m. Saturday at 200 N. Closner Blvd. in downtown Edinburg. An Easter celebration at the Museum of South Texas History, this event is designed to welcome the whole family to decorate cascarónes, or egg shells, and take them home. Decorating and filling eggs for Easter egg hunts are part of South Texas and northeastern Mexico traditions. Many families come together to decorate eggs with paints and tissue paper and fill the empty egg shells with confetti. These eggs are then hidden to be found by young children during the Easter egg hunt. Once found, these eggs are gleefully cracked on a person’s head. A 2:45 p.m. Easter egg hunt at the museum’s Paseo area will be part of Cascarón! Other activities will include UTRGV’s Book Buzz reading Easter-related stories to families starting at 1 p.m. and another session at 2 p.m. Book Buzz’s objective is to promote literacy across the Rio Grande Valley by organizing book donations and volunteering within the community. Families are encouraged to bring blank egg shells to decorate at the museum. Blank and pre-painted cascarónes will be available for purchase as well, while supplies last. The decorated and confetti-filled Easter eggs can be added to the Easter egg hunt, or taken home. Families are encouraged to bring baskets to use during the egg hunt. Rio Grande Legacy. The Cascarón! event is included in regular museum admission: $7 adults (ages 18 and older); $5 seniors with ID (ages 62 and older) and students with ID (ages 13 and older); $4 for children (ages 4 to 12); free for children ages 3 and younger. FRIENDS of the Museum are admitted free as a benefit of FRIENDship. For more information on the event or becoming a FRIEND of the Museum, call (956) 383-6911. 10 prize eggs. Cost is $5 for children 3 and older and $3 per adult. For more information, visit www.quintamazatlan.com or call (956) 681-3370. The American Legion Loyal Service Post 37 will host a children’s Easter Party from 1 to 3 p.m. Saturday at 1305 E. Jasmine Ave. in McAllen. The party is sponsored by the Legion Family, a veterans organization. A magician will perform, and the Easter Bunny will give out eggs with toys and candy inside. Food will be provided free to all children attending. Adults are asked to provide a $2 donation per person. The event is open to the public. Veterans of Foreign Wars Post 10802 will host an Easter Egg Hunt at 1 p.m. Saturday at 509 W. Business 83 in Donna. All children are welcome and the event will include hot dogs, chips and soda. For information, call (320) 282-2806. Mr. Gatti’s Pizza will host the Easter Bunny for photographs starting at 5 p.m. Friday at 4100 N. Second St. in McAllen. HEB Park will host an Easter egg hunt at 6:30 p.m. Saturday at 1616 S. Raul Longoria Road in Edinburg. The event will offer food, music, golden eggs with grand prizes and free baskets for children. Tickets start at $5 per person. Bass Pro Shop offers free crafts as well as a free 4-by-6 inch photo with the Easter Bunny beginning at 2 p.m. Friday at 101 Bass Pro Drive in Harlingen. Charlie Clark Nissan will host an Easter egg hunt at 6 p.m. Friday at 301 N. Ed Carey Drive in Harlingen. Rodeo Dental & Orthodontics will host an Easter celebration and egg hunt at 3 p.m. Friday at 4023 U.S. 83 in Rio Grande City and 2 p.m. Saturday at 1901 W. Expressway 83 in Weslaco. The event will include photos with the Easter Bunny. Cross Church-McAllen Campus will host an Easter event including a community egg hunt, bouncers, a message from Executive Pastor Abram Gomez and more at 10 a.m. Saturday at 2100 W. Nolana Ave. in McAllen. International Museum of Art & Science will host a Bunny Bash at 10 a.m. Saturday at 1900 W. Nolana Ave. in McAllen. Featured events include jelly bean science, bunny art, story time and an egg hunt. Cost is general admission. Desperado Harley-Davidson will host pictured with the Harley Easter Bunny beginning at noon Saturday at 1201 S. Bentsen Road in McAllen. St. Mark United Methodist Church will host an Easter party including crafts, story time, snacks and an Easter egg hunt beginning at 11 a.m. Saturday at 301 Pecan Blvd. in McAllen. Edinburg Scenic Wetlands & World Birding Center will help attendees create eco-friendly cascaronés using natural dyes, fun techniques and bird seed beginning at 2 p.m. Saturday at 714 S. Raul Longoria Road in Edinburg. Bring an old T-shirt and learn how to transform it into an Easter basket. Cost is $2 for WEBC members and $4 for non-members. Easter Expo 2018 is a free family event beginning at 11 a.m. Saturday at 3211 N. Victoria Road in Donna. It will include a Texas Size Egg Hunt, games, free popcorn, snow cones and drinks while supplies last. Goliath Toys and Retro Games, in partnership with Toys Nation, will host 2018 Easter Egg Hunt at 2:30 p.m. Saturday at 1128 W. Monte Cristo Road in Edinburg. The annual Easter egg hunt will begin at 10 a.m. on the Patio Lawn at Harlingen Country Club, 5500 El Camino Real in Harlingen.